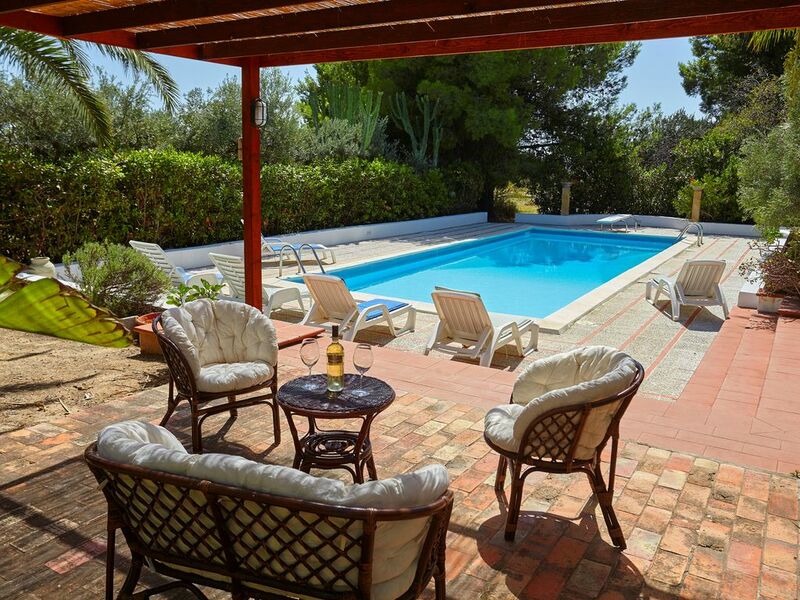 This charming Villa with a beautiful pool is set on high ground amongst the olive trees. A great choice for an active holiday. Suggestive and surrounded by peaceful rural location, charming outdoor living, with its covered terraces ideal for a large family with its 4 bedrooms, together with the annexe you have ample space for up to 9 guests. The main house has a large warm and old style furniture living/dining room with open fireplace, kitchenette, 1 double bedroom; 2 twin bedrooms; 1 Bathroom with tub, 1 shower/WC. In the annexe a large living room communicate directly with a double with en-suite wc/shower. The villa has satellite TV, WiFi, air-conditioning and outside shower. The outside space has a wonderful mediterranean well keep garden, with in its centre a nice swimming pool 5x12 mt. Al fresco facilities include two lovely covered terraces with a dining and barbecue area. Only five kilometres from the property, restaurants and bars in Sciacca. Sandy beaches only 7 kilometres, and Agrigento and its famous Valle dei Templi is 60 kilometres. Das Haus liegt auf einem großen Grundstück, etwa 5 km von Sciacca Zentrum und dem nächsten Strand entfernt. Die Ausstattung ist top, der Vermieter sehr freundlich und er betreut seine Gäste sehr gut. The house is located on a quiet hill surrounded by olive trees. Sciacca and the south coast are nearby with all kinds of tourist attractions. The owner (Giovanni) is very helpful and friendly and a delight to talk too. The garden and pool are beautiful and well maintained. Our kids had a great time playing. The house is well equipped and very cosy. One point for improvement is the beds. All beds were to hard to our liking. Also the bathroom in the studio smelled of carbolineum. Even with these shortcomings we recommend this house! Wir hatten eine wunderbare Woche in der Villa. Erwachsene und auch Kinder haben sich rundum wohl gefühlt. Der Pool war sehr sauber und wurde täglich gereinigt. Der geräumige Wohnbereich des Hauses ist sehr wohnlich ausgestattet. Giovanni der Vermieter hat uns wunderbare Tipps für Ausflüge in die Umgebung geben und das Olivenöl aus dem Villengarten schmeckt ausgezeichnet. A beautiful, quiet house in the countryside. We had a wonderful 10 days here at the end of August. We found the house very comfortable and well-equipped. The outside terrace was especially nice for eating and lying in the hammock. The pool was large and had a deeper end for diving. As we had two teenage children with us we made good use of the self-contained annex which made them happy! Our host was a very charming man with fluent English. He came every other day to clean the pool and check if we had any problems. He gave us some recommendations about local beaches. We all agreed we wished we owned the house ourselves! Très agréable villa sur les hauteurs de Sciacca. Le jardin en est le point fort, avec une piscine de 10 m x 4 m entourée d'arbres, et de 350 oliviers. Nous tenons particulièrement à remercier le propriétaire Giovanni pour sa gentillesse et sa disponibilité (une petite panne de l'éclairage de la piscine et un électricien est immédiatement dépêché sur les lieux). Franchement, l'accueil et la courtoisie de ce garçon sont exceptionnels. La maison est au calme, même si la nuit, on peut entendre quelques chiens aboyer ! L'intérieur est tout aussi agréable, la cuisine est le point faible car elle est minuscule. Mais la maison est tellement agréable qu'on en oublie ces détails. La ville de Sciacca n'a pas d'intérêt particulier mais est située au carrefour de sites exceptionnels, la vallée des temples à Agrigente, Cégeste et Sélinonte... Nous avons également loué un bateau sur Castellammare del Golfo... Bref, pour visiter le Sud et l'Est de la Sicile, cet endroit est idéal ! Significant thermal spa and famous hotel resort, Sciacca is a small town with interesting medieval buildings and a residential area built in Arabian style. Lovely sandy beaches in Sciacca and surroundings. Thermal baths, lido. Fishing and yacht harbour. Agrigento and the temples valley approx 70 km, Selinute 30 km, Eraclea Minoa 25 km, Segesta 70 km, Palermo 100 km..